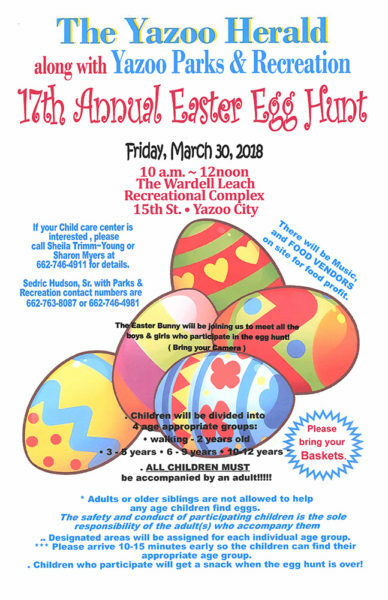 Details: The Yazoo Herald and Yazoo Parks & Recreation present the 17th Annual Easter Egg Hunt on Friday, March 30, 2018, from 10 am to Noon at the Wardell Leach Recreational Complex on 15th Street in Yazoo City, Mississippi. There will be music, food vendors with food for sale. The Easter Bunny will be joining us to meet all the boys & girls who participate in the egg hunt so be sure to bring your camera! Designated areas will be assigned for each age group. Adults or older siblings are not allowed to help any age children find eggs. Please bring your own Baskets. Children who participate will get a snack when the egg hunt is over! If your childcare center is interested in attending as a group, please call Sheila Trimm-Young or Sharon Myers at 662-746-4911 for details. For more information, contact Sedric Hudson, Sr., Executive Director of Yazoo Parks & Recreation at 662-763-8087 or 662-746-4981.